Pull on your hiking boots folks and join us for the final push to the top of Mt Kosciuszko as we send a loud and clear message to the NSW Government – Kosciuszko: It’s a park, not a paddock! 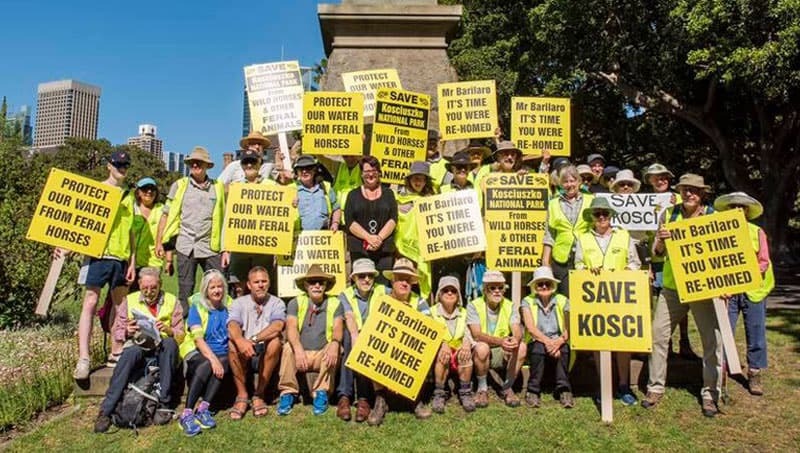 Join the long-distance Save Kosci walkers who have hiked all the way from Sydney to the summit of Mt Kosci in protest at the decision to protect feral horses in Kosciuszko National Park at the expense of its incredible natural values. Our Save Kosci walkers set out from Sydney on November 3 and after 560 km will be making their final ascent of Mt Kosciuszko on Sunday, 9 December, from Charlotte Pass. You can walk all or part of the last day with them. Where: Meeting at Charlotte Pass, Kosciuszko National Park. Distance: 19km to Mt Kosci and return. Time: Registration from 7.30am for an 8.30am start. If you would like to take the shorter route up to the summit, there will be another group of Save Kosci walkers leaving Thredbo to complete the 13km return trip at 8.30am. IMPORTANT: In case of inclement weather, the alternative date for the walk will be Saturday 8 December. Walkers will be advised if a date change is required by December 5 or 6, based on weather forecasts. Feral horses are highly destructive animals that destroy alpine habitats, stomp fragile waterways and threaten native wildlife. They belong in a paddock, not our park. You can support our campaign to save Kosciuszko National Park by making a donation today.